The options available when trying to choose a new garage door can be overwhelming, the first choice to make usually revolves around the actual material of the door. But what are the different options available? Read on for a run through of some of the most common materials and what you need to know about all of them. 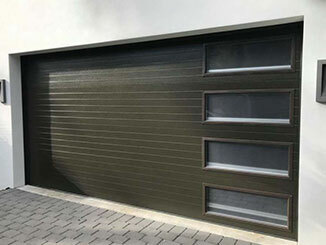 Steel doors remain the preferred option for many garage door owners. They are of solid quality, light in nature and can be a great choice for most residential properties. However, without proper maintenance, they can be prone to rust. Vinyl goes much further than being used as a round music plate. This material was given a nickname – “kid proof” - due to its resistance to breaking and denting. Vinyl doors are basically an updated version of fiberglass doors. The main problem – which some people really won't even consider as a problem – is that they are offered in limited designs and colors. Fiberglass is a high-quality material that a range of stylistic choices. It can also easily mimic any other material; for example, it can be sand-blasted to look like wood. It is also highly durable, but not recommended to be used in areas prone to harsh weather or storms. Wood remains one of the most aesthetically pleasing materials for garage doors. It can be remodeled to your taste, and with proper care, it will last just as long as a steel door. However, this is one of its major cons – it is very high maintenance. People who purchase wooden doors usually do it for the beautiful aesthetic appeal, and a poorly maintained door is something that is very easily spotted. Cracks, mold, and paint peels are just a few of the things wooden door owners have to watch out for. Plastic garage doors might not be as conventional as wooden or fiberglass doors, however, they can still be found on the market and may be sourced for a slightly cheaper price. However, one can't deny the environmental issue this material poses, in addition to it's weakening and fading over time. It's not top of our list. Aluminum is quite similar to steel; however, garage doors made from aluminum tend to be lighter. Like fiberglass, aluminum can be manipulated to give off a 'woody' appearance. High-quality aluminum is usually dent resistant and insulated. Unlike steel doors, aluminum is fairly rust proof but can be quite costly to buy and maintain. Consider how much you would like to spend when it comes to both money, and of course the time you may have to dedicate to required maintenance. Our company would love to assist you every step of the way - just give us a call at Garage Door Repair Oak Park for assistance.